This post is sponsored by the Florida Department of Citrus. 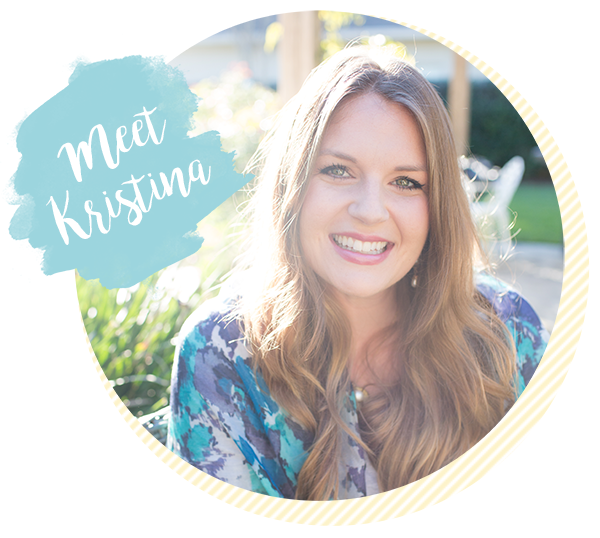 Let’s talk about those baby cabbages that are so versatile and tasty! 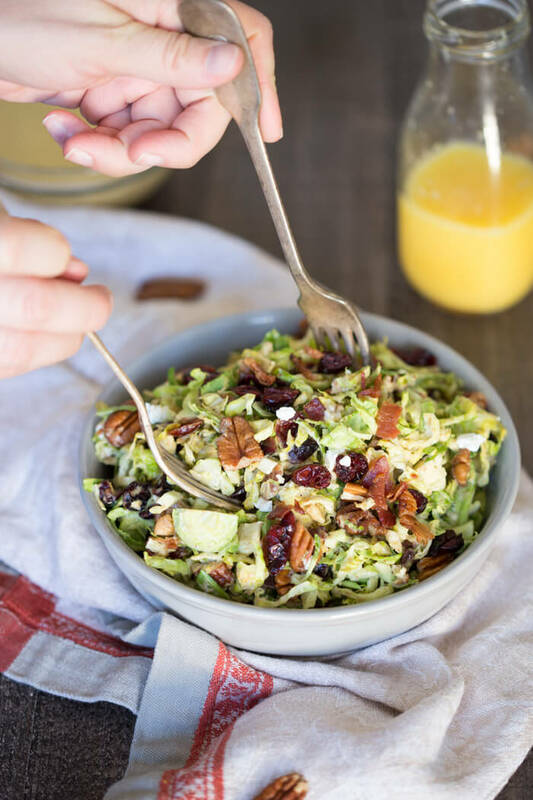 Brussels sprouts can be prepared in so many different ways, and today, they are prepared RAW in this Shaved Brussels Sprout Salad with Citrus Bacon Dressing! Yes, you heard that right, raw sprouts! Typically we cook (ehhm, roast) these little gems, but leaving them raw makes an excellent base to a holiday salad! 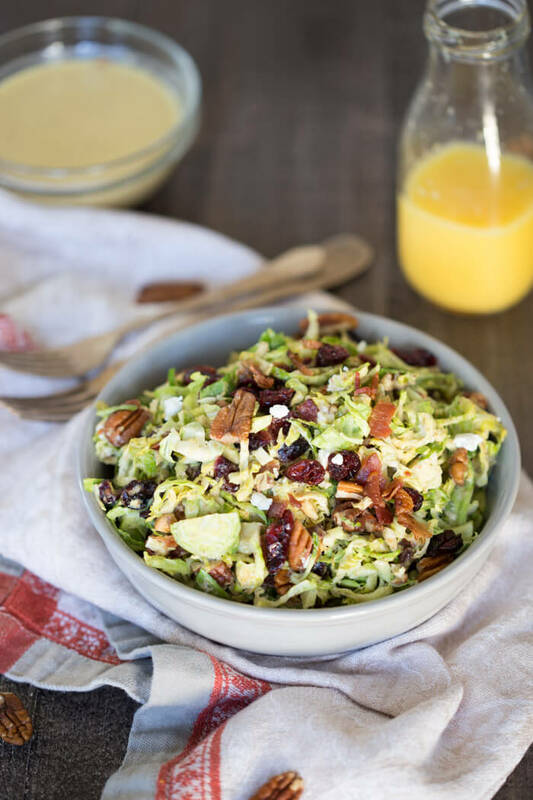 Those crispy, crunchy shreds of sprouts need a burst of flavor coming from a zesty dressing to give them that final punch. Low and behold, Florida Orange Juice to the rescue! Citrus is a great way to ramp up any salad dressing, giving it that sweet, tangy, and fresh flavor to accompany your vegetables and add-ins. 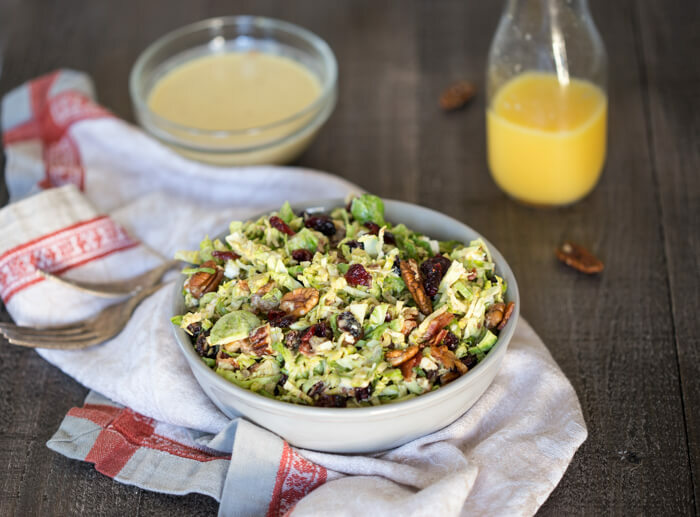 Florida Orange juice is incorporated into the Citrus Bacon Dressing, adding to the many health benefits that this salad already has to offer! In partnership with the Florida Department of Citrus, I wanted to dedicate a holiday side dish that would exemplify the orange, but also save you time in the kitchen so you can continue the holiday festivities with your friends and family. By the way, did you know that Florida Orange Juice contains no added sugars and provides many key nutrients such as vitamin C, potassium, folate, thiamin, magnesium, and vitamin B6. Added bonus: some calcium-fortified orange juice is enriched with vitamin D, which helps with bone strengthening, serving as a lactose-free alternative to dairy foods and beverages. I decided to add in some crunchies to the salad: PECANS! …because every salad needs some crunch and healthy fats that also help with the vitamin D absorption. 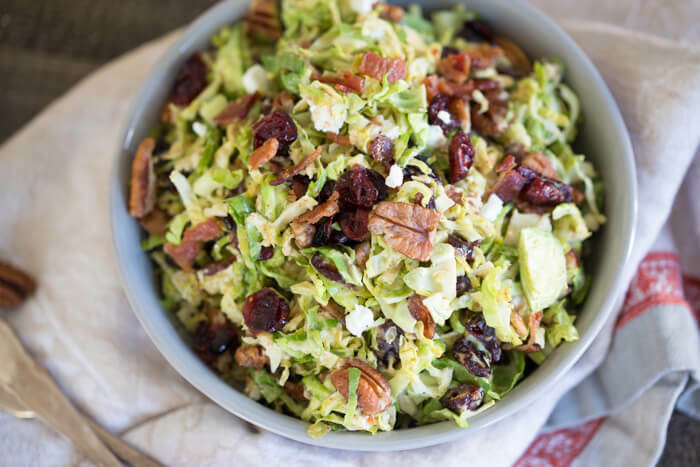 The pecans and dried cranberries in this Shaved Brussels Sprout Salad not only gives the salad different textures, but you experience different flavors with every bite! And what is more holiday than a gorgeous salad on your family-style table, that is colorful and studded with nuts and dried fruit? 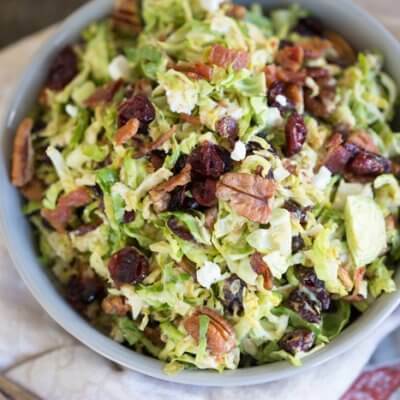 Make this Shaved Brussels Sprout Salad with Citrus Bacon Dressing your easiest side and one of the best crowd-pleasing dishes at your holiday meal! 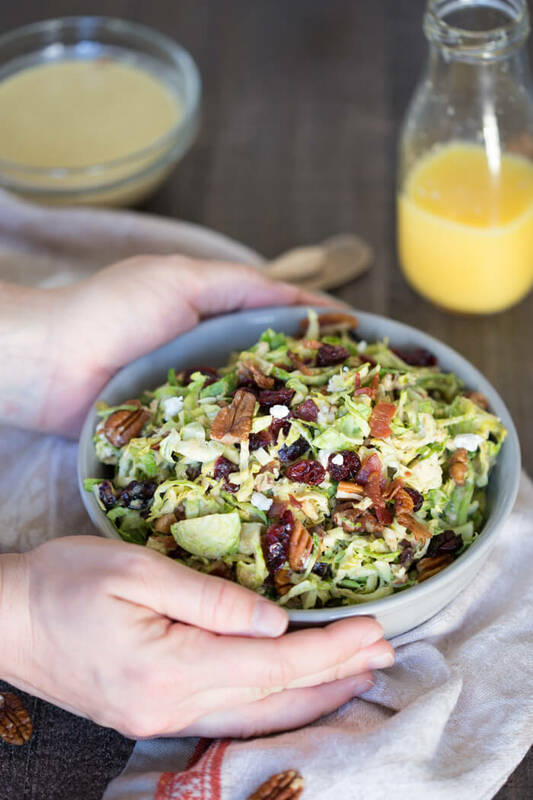 Shaved Brussels Sprout Salad with Citrus Bacon Vinaigrette… the best hearty and nourishing winter side salad to add to your holiday menu. In a blender or food processor, add shallot and pulse to mince. 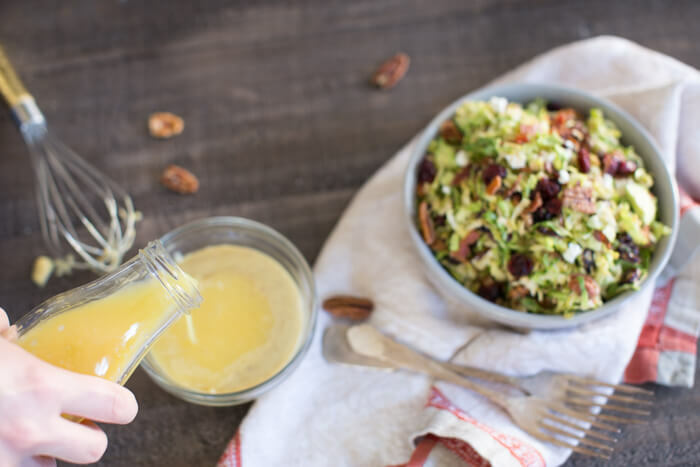 Add Florida Orange Juice, olive oil, goat cheese, mustard, honey and bacon to the blender and pulse until dressing is fully combined and smooth. Place shaved Brussels sprouts in a large bowl and toss with dressing. Fold in cranberries, pecans, bacon and goat cheese and serve. To shave Brussels sprouts, cut ends off the sprout and cut in half lengthwise. Rotate sprouts 90 degree and very thinly slice to make shreds. To save time, shred Brussels sprouts in the food processor or with a mandolin or purchase pre-shredded Brussels sprouts! What a beautiful salad! This will be a great addition to the holiday menu! 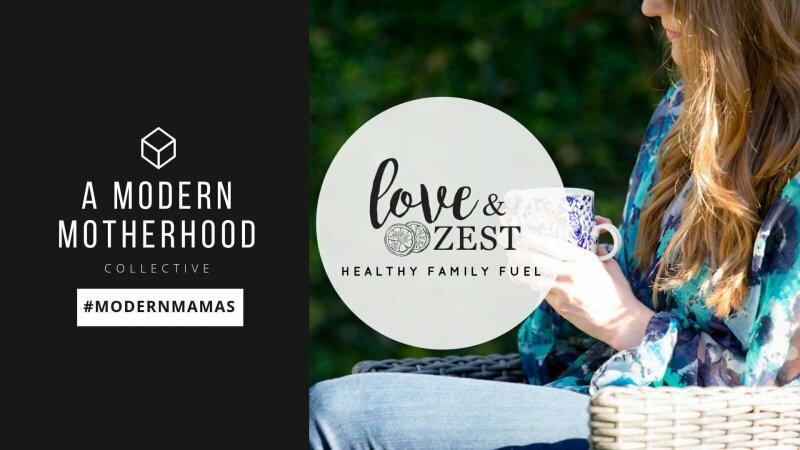 This is such a good recipe idea! 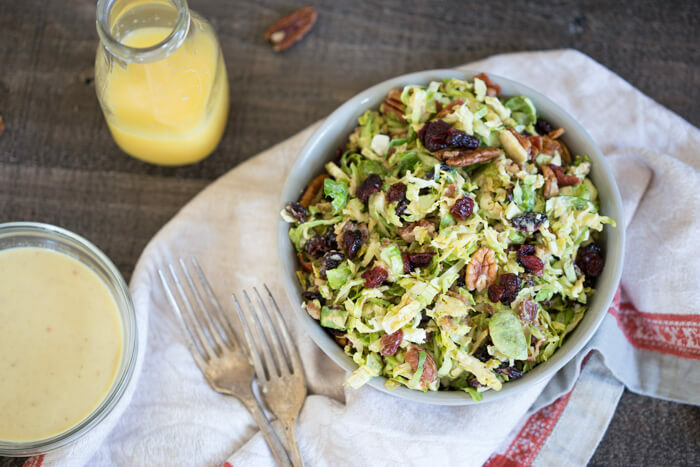 I bet orange juice and brussels go brilliantly together – and the cranberries and bacon add such nice balance. What a salad! This would be a great lunch or dinner! My family loves Brussels and my oldest LOVES Brussels and bacon. I wonder if I can make the dressing with vegan bacon (to still get flavor and saltiness) and then add just to the two in the family that like it and leave it off mine and my youngest daughters. I just love all the flavors you have and imagine the citrus and bacon are a great sweet and salty combo. 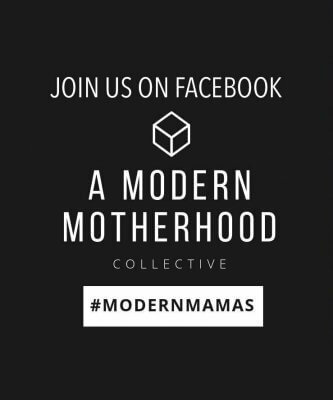 Can’t wait to give it a try!! This sounds like such a perfect winter salad! I absolutely love sprouts. Serving them in a salad like this is so clever. This is such a lovely idea for leftovers on Boxing day.